Eleonora di Toledo was the first Duchess of Florence and the first Grand Duchesse of Tuscany. As the wife of Cosimo I Grand Duke of Tuscany, she became one of the most important women in the history of the Medici family. Involved in the public affairs, she was not loved by the Florentine people. She was a patron of painters and sculptors, and the subject of one of the most beautiful portraits ever made in Renaissance Florence. Eleonora di Toledo, Duchess of Florence, was born in Spain in 1522 by Don Pedro and Maria Osorio Pimentel, Marchioness of Villafranca. The mother was the last heir of her house so that the act of marriage to her husband passed on the feud and the title of Marquis of Villafranca. His father was cousin of Ferdinand the Catholic; after the latter’s death Don Pedro had distinguished himself especially in the rebellion of Navarra to bring it back to obedience to the legitimate heir of the Catholic, Emperor Charles V. The valor and loyalty to the emperor earned him the opportunity to be appointed viceroy of Naples, in 1532. In Naples Eleonora spent her youth, between the lavish parties, the glitz of the clothes and the rigid etiquette “to the Spanish” viceregal court. The pomp of the court, the rank of the family, but also the awareness of living in an environment hostile to the Spaniards in general and his father in particular had to impress an indelible mark on the personality of Eleonora di Toledo, dictating haughty and unfriendly attitudes that will then be reprimanded by his subjects, especially Florentines. Little is known of her education; you can only deduct from the later events of her life that she had to get an adequate education to the social role of the family: an education strongly based on the principles of the Catholic religion. She moved to Florence in 1539, after her marriage to Cosimo de Medici, who recently had become Duke of Florence. For the young Cosimo (he was born in 1519), the tragic death of his cousin Alessandro had unexpectedly taken him away from a dark and modest (under all points of view) condition, and the marriage constituted a unique opportunity to establish useful political alliances that would allow him to consolidate his position domestically and internationally. He in fact was aimed primarily at establishing a closer link directly with the emperor, from whom he depended for his stay at the top of the Florentine state (made precarious by the plots of the exiles, who were benevolent listening to the French court, and the cumbersome protection by the group of nobles to whom he owed his appointment to succeed the Duke Alessandro), as the very existence of the Duchy of Florence as an independent state was constantly threatened by the long conflict between the emperor and the king of France and the appetites, masked behind repeated declarations of neutrality, of Pope Paul III. To negotiate the conditions of the marriage Cosimo sent two emissaries to the court of Naples, Luigi Ridolfi and Jacopo de Medici, who left Florence in February 1539. The deal provided for the payment by the Toledo of a dowry of 20,000 crowns; Cosimo on his part promised to the bride, through its attorneys, two donations, totaling 30,000 shields. Despite the favorable outcome of the negotiations about the marriage, the departure of Eleonora for Tuscany was delayed by almost two months. Meanwhile she was, according to the agents of the Medici, very eager to get the groom and to begin his new life and practiced the understanding of the Italian language, trying to read unaided letters Cosimo sent and to whom she answered in Spanish. Finally on June 11 Eleonora di Toledo sailed from Naples accompanied by her brother Don Garzia and a large following of knights and ladies mostly Spaniards who demanded, along with the luggage, the equipment of seven galleys. The day after her arrival the ducal couple, accompanied by a large following (the Spanish nobles from Naples joined the Florentine aristocrats who had accompanied Cosimo in Pisa), were headed for the Medici villa at Poggio a Caiano, where they stayed a few days before the solemn entry into Florence. Meanwhile, in the Medici palace in Via Larga, the former residence of the Duke Alessandro, there was intense preparations for the wedding celebrations, which contemplated banquets, music and theater performances and that, started after the solemn religious ceremony in the Basilica of San Lorenzo, continued for some days. The record of these festivities, described in a letter from the writer Pier Francesco Giambullari to the Florentine in the imperial court, Giovanni Bandini, was later printed. With these lavish festivities, crowned with distributions of alms, Cosimo it intended not only to revive the artistic and cultural activity of the city, completely off after the long siege of 1530, to win the sympathies of the people of Florence. The marriage was rather a complete success from a political perspective for Cosimo: in fact it granted him the permanent support of one of the most powerful factions in Spain and put it on the same plan of the rulers of other states that made up the composite Empire of Charles V. In other words, the relationship with Toledo became the Medici temporarily protected by the emperor as a permanent member of the confederation of states that had the common point of reference in the emperor himself. This fact was duly noted by Charles V in his direct instructions to his son Philip II on Jan. 18. 1548: “The Duke of Florence”, he wrote, “has always been very devoted … Given his relationship with Toledo … and the situation of his state … you will do well to favor him in every matter”. Despite the highly political logic behind, the marriage of Eleonora di Toledo was very happy, cemented by a deep bond of respect and affection between the couple (something unusual at all for the princely marriages of the time). In addition to her many children, Eleonora also took care of Bia de Medici, a natural daughter of Cosimo born before the marriage. The entry of Eleonora di Toledo in Palazzo Medici marked a revolution in lifestyle, until then rather simple and typical of an almost bourgeois family: soon the old palace in Via Larga, built by Michelozzo in the previous century by Cosimo the Elder , proved too small to accommodate the crowd of ladies, knights, servants, mostly Spaniards, of which the duchess liked to surround herself; therefore, in 1540, a few days after the birth of the eldest daughter, Maria, the ducal family moved in the former Palace of the Signoria, which was renovated to fit the needs of the family; in particular, Eleonora’s apartment was equipped with a chapel, frescoed by Bronzino, and a terrace with a roof garden. Later, in 1549, Eleonora bought for the family the Pitti Palace, equipping it with a monumental garden (Boboli Gardens). 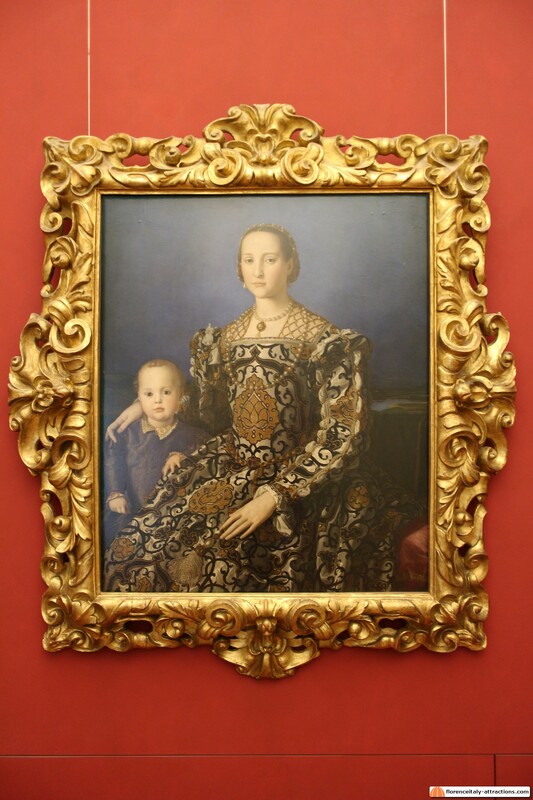 As the Duchess of Florence, Eleonora was often in charge for public affairs, when her husband was away for diplomatic missions and also when Cosimo was struck by a serious illness. The weight of Eleonora di toledo in the political life of the Florentine state was relevant even outside of these periods of regency, in which the absence or incapacity of the Duke made it even formally in charge of the government of the Duchy. Duke Cosimo, for the most important issues sought the opinion of its secretaries, but then reserved the final decision himself, after consulting with Eleonora and her uncle, Don Francesco de Toledo, who as ambassador almost always lived in Florence at the Medici court. Scrolling through his correspondence (mostly merged into that of Cosimo) shows that the activity of the Duchesse unfolded primarily in filtering through the many requests, favors, subsidies, assignments of all kinds that many had turned to the Duke but that were addressed to her, with the request, expressed or implied, of her intercession with Cosimo in favor of the applicant. Another area that attracted, in particular, the commitment of Eleonora was financial investments: she was concerned at first hand to get substantial cash loans by Florentine bankers and used the sums of money in real estate purchases (in addition to the Palazzo Pitti, she bought in her name vast estates in Maremma, Pisa and Livorno and feuds of Castiglione della Pescaia and Giglio Island). 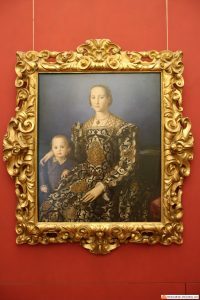 Of great importance was the activity deployed by Eleonora in the field of culture: she worked for the reopening of the University of Pisa and to facilitate the finding of accommodation in the city for students and professors; her patronage also turned to the visual arts: Agnolo Bronzino was one of his favorite painters, author of many portraits of Eleonora and of other members of her family, and for sculpture and jewelry she commissioned many works to Benvenuto Cellini. Despite numerous pregnancies and serious illness, probably pulmonary tuberculosis, which struck her in 1558 and then again several times in the following years, Eleonora shared all activities of her husband:traveling across the state, hunting and fishing in Pisa and Livorno, also to oversee the many reclamation works undertaken by the Duke, as the long winter stays in Pisa and Livorno. In addition to hunting and fishing and conversations with artists and writers, Eleonora’s favorite pastimes were playing cards and betting; in her books it is not uncommon to come across records of sums, often substantial, paid or received for this reason. Despite her intellectual qualities, and despite the undoubted merits, Eleonora di Toledo was not loved much by the Florentines, who reproached the Spanish nationality and the arrogance; Eleonora undoubtedly preferred the company of fellow countrymen (it seems to have had serious problems even with the use of the Italian language), with whom she entertained cordial relations and tried to promote them in every way (for example: a chapel in the Florentine church of Santa Maria Novella, called “chapel of the Spanish”, was reserved to her friends). The life of Eleonora di Toledo was marred by a series of family losses: the eldest daughter Maria died at seventeen, her youngest daughter Lucrezia also died shortly after her marriage to Alfonso II d’Este. In the fall of 1562, while was traveling in the area of Livorno and Pisa with her husband and two sons Giovanni, recently risen to the rank of Cardinal, and Garcia, both sons fell ill with malaria and died a few days apart from each other. A few days later Eleonora, infected by the same disease or more likely the recurrence of pulmonary tuberculosis she already suffered and in a state of mental and physical exhaustion following the death of her children, died as well in Pisa on December 17 1562. She was buried after solemn funeral in the Basilica of San Lorenzo in Florence.